Blast Targets Shiites In Pakistan; Dozens Killed : The Two-Way At least 28 people were killed in the blast outside a Shiite mosque as people were leaving evening prayers. Sunday's attack follows an attack on Shiite Hazaras in Quetta last month that killed more than 90 people. 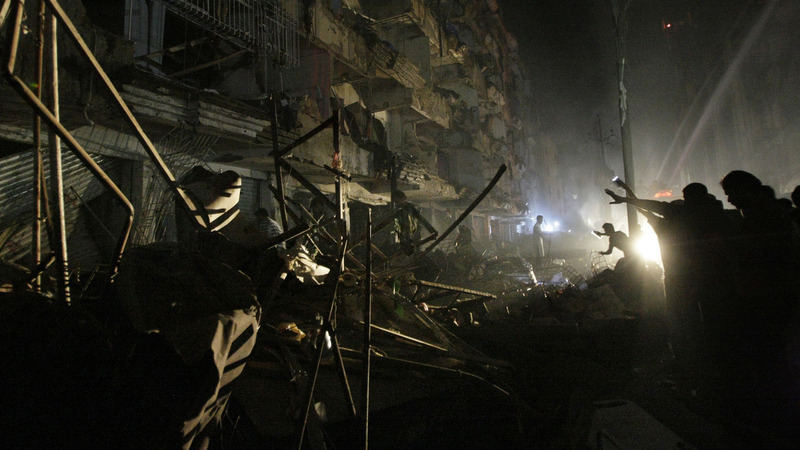 Pakistanis check the site of a bomb blast in Karachi on Sunday. Pakistani officials say the blast has killed dozens of people in a neighborhood dominated by Shiites. Dozens of people are dead in the Pakistani port city of Karachi following a blast Sunday near a Shiite mosque. Authorities now say at least 37 people were killed and another 141 wounded in the blast. "The bomb exploded outside a Shiite mosque as people were leaving evening prayers, said police official Azhar Iqbal. Men, women and children were among those killed and wounded, he said. "At least 28 people were killed and 50 others were wounded, said a top government official, Taha Farooqi. He said some people were feared trapped in the rubble of buildings that collapsed in the bombing. "No one has claimed responsibility, but Sunni militants linked to al-Qaida and the Taliban have targeted Shiites in the past, claiming they are heretics." Sunday's attack follows bombs targeting Shiite Hazaras in Quetta last month and in January. Those attacks killed more than 100 people. Following the January attack, Pakistan's Supreme Court faulted the government for its "dismal failure ... to provide safety/security to the people." "The government was unable or unwilling to break the links between Pakistan's military and intelligence agencies with extremist groups. Sunni militant groups, including those with known links to the Pakistani military, its intelligence agencies, and affiliated paramilitaries, such as the ostensibly banned Lashkar-e Jhangvi, operated openly across Pakistan, as law enforcement officials turned a blind eye to attacks. The government took no significant action to protect those under threat or to hold extremists accountable." Shiites make up about 20 percent of Pakistan's 180 million people.